Visit several pool deck projects with designer/contractor Scott Cohen to see how he lays out pool decks taking into consideration sun, shade, privacy, views, the size of the yard and more. See some beautiful projects and get ideas. Provide more ample deck space in a certain area to encourage people to congregate in a particular area, along with the use of furniture and tables. In other words, the area of the deck used most will be that part that can accommodate the most people, and in which they may sit down and rest their drinks, reading material, etc. 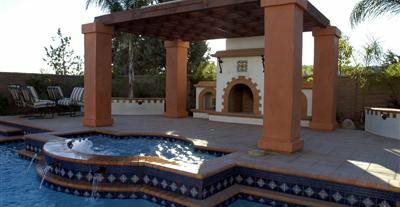 The barbecue area, waterfall, hot tub, Jacuzzi, or any other feature that naturally draws people to it should also be designed to be placed in the area that is the best environment for them to congregate. This seems obvious, but quite often more thought is given to the type of feature the owner wants to install, than on how the location of its installation will affect group dynamics and the overall aesthetics of the overall design. Tips on selecting the right size and shape for your pool deck. 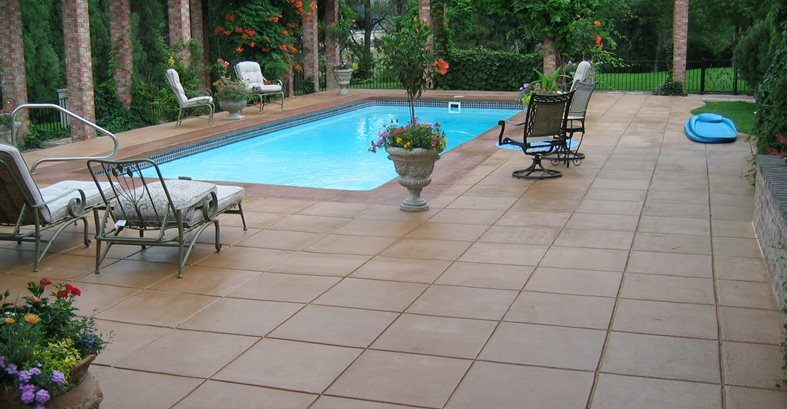 Visit several projects to see concrete pool deck styles, shapes and designs. Designer, Scott Cohen, explains the design of each pool deck. Orient your deck to take advantage of surrounding views both from within and outside the pool area. While it may seem more logical to have a deck layout in which people have the house at their backs, this is not always desirable. A view of a striking, well-landscaped rear façade may be more aesthetically pleasing than a backyard fence or a view of a neighbor's home. If your home is surrounded by striking natural views, such as mountains, hills, rivers, lakes and sunsets, they should be accentuated by the deck orientation whenever possible. If there are unsightly or unwanted views, consider how they might be screened or orient the deck to minimize them. Fencing or landscaping can be aesthetically pleasing solutions to blocking unwanted views and maintaining privacy and security. Congregation and lounging areas should be as far removed from your neighbors as the property or pool environment allows. Sounds—both those coming in from neighboring houses and traffic and those created by your pool activities—can be at least partially screened with the use of running water, such as a waterfall or fountain. Vegetative plant buffers and earthen berms built from soil excavated from the pool are helpful in maintaining privacy as well as for dampening sound. Also consider the proximity of the pool to your house. In small backyards, a pool located close to the home can be noisy for those inside when people are playing or splashing in the water. A pool set away from the house should still be visible from the house so you can monitor security and control usage.